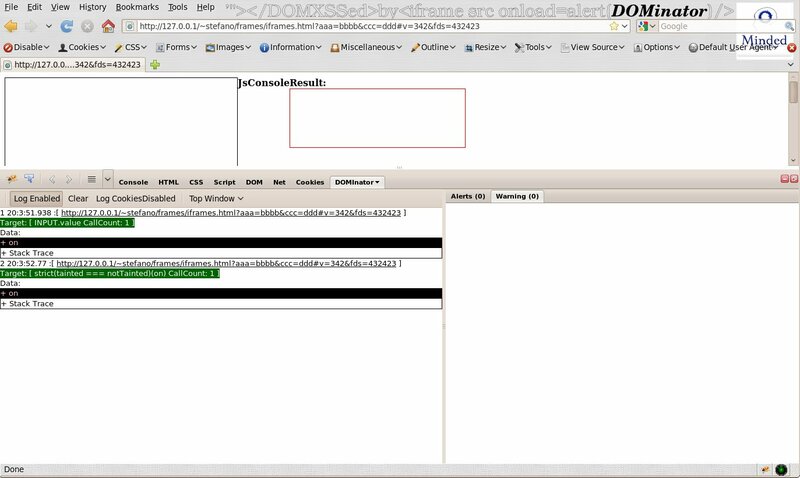 Does Dominator only locate DOM-based XSS issues, or can it find other client-side vulnerabilities? It adds taint propagation to particular strings you can choose. So if one wants to track some other kind of issue it can be done. DOMinator helps analyzing particular flows by giving information to the tester about what happened. You can add new sources and new sinks whenever you want and let DOMinator warn you when some particular operation is performed. I suggest you to have a look at http://dominator.googlecode.com/files/DOMinator_Control_Flow.pdf to have a more insightful perspective. BTW - you may want to rephrase the part where you say that you downloaded 1 million sites and used DOMinator on them. Your actual sample set for the statistics you quote was 100 sites only, not 1 million, right? that's confusing. thanks, it seemed clear to me, but if you say it's confusing. and we tested *only* the first 100 sites of that top 1M using DOMinator. The result is that 56 out of those top 100 sites were vulnerable to exploitable DOMXss. 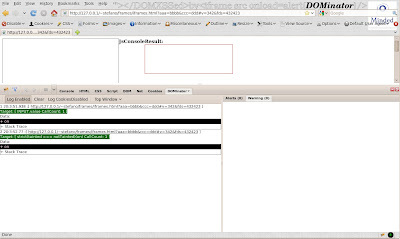 You say DOMinator is "the first runtime tool which can help security testers to identify DOMXss." That is not correct. See, e.g., FLAX (http://webblaze.cs.berkeley.edu/2010/flax/flax.pdf) or Kudzu (http://webblaze.cs.berkeley.edu/2010/kudzu/). Since I have followed DOMxss research evolution from the beginning, I would say that both Flax and Kudzu seem to work on very abstract input and sink definition. Also the targeted application seemed to be very buggy and cannot be comparable with Top 100 Alexa Sites. I would ask to try the UTF7 Fuzzer against Gmail / twitter / etc. and try to find some vulnerabilities. I think it would end up in some false positives. The automation as far as I understand in Dominator is just meant to be consistent with the Inputs and Sinks presented in the DomXss Wiki. There is no need anymore of an abstract input generator. Thanks for your great work and your presentation at SWISS Cyber Storm 3! 1. I see two wonderful research papers, but no public url to the tool. 2. DOMinator is a tool that "helps" security tester in finding DOMXss, differently by yours which seems to be fully automatic. But I'm not sure, since afaik your tool is not public. So, sorry but i think my phrase is correct. I managed to get it working under Backtrack 5. The stack trace feature doesn't seem to be working in Linux 32 bit. I've clicked the stack trace enable button a few times to see if that made a difference. The app I'm working on is minified, but I don't think that's the issue. Secondly, if you can add CSRF token following, that would be awesome. For example, if it could take the ASP.NET MVC RequestVerificationToken value and submit it every time it changes, that would be good. I found that Dominator would get blocked pretty quickly. However, I did manage to find a DOM based XSS in a few minutes once I had it going and understood what it was trying to tell me. We can keep talking about you issues on the mailing list. i wanted to test it, but it´s not compatible with FireFox 6 (WIN). Do you plan to release an upgraded version or do i have to downgrade FireFox ? DOMinator is not a firefox plugin. It uses Firefox as a base but it modifies Spidermonkey (JS engine) in order to follow external inputs and identify DOM based Xss. It should be considered as a stand alone software, not as a plugin. Dominator is definitely a handy tool. Thanks for sharing it to the community. As per my understanding DOM based XSS is different than regular XSS only the way it is automatically scanned. Please correct me if I'm wrong. As in regular XSS, you inject a vector in the HTTP request and look for the presence of the pattern in the response, which may or may happen with DOM based XSS. As anything after the # in the URL isn't sent to the server. Do you agree with me? If yes, does that mean that if I inject the vector in page which may be susceptible to DOM XSS and scan the updated DOM may be programmatically or by manually saving the page to disk will confirm me the issue? > Dominator is definitely a handy tool. > XSS only the way it is automatically scanned. > with DOM based XSS. > server. Do you agree with me? recreate the environment where the vulnerability could be exploited. could be more complex to reproduce. Thanks for being patient in explaining the details to me. I agree to all your points. My next question is, Can POST var be potential sources to DOM XSS or its just GET params and HTTP Headers? On the other side if some value from the payload is used to instantiate a Js variable, then it could be considered as a potentially "indirect" source. Also, if you have more questions about DOMXss, contact me via email. i have found some html injection in sites with dominator and got alert box in the dominator browser ,but whenever i try to re produce it in other browsers like mozilaa chrome etc it dosent show alert box ,why is that ? Any way i can get it done ?